Appearing on the Alex Jones Show today, Pastor Lindsey Williams provided further details on the ongoing plan by the global elite to destroy America, consolidate financial power, usher in world government, and reduce humanity to a slave class. Gas prices will rise to between $4 and $5 per gallon in the next few months. Photo: Eden Picutres. Lindsey Williams told Jones his source – described only as a CEO in the Big Three Oil industry who traveled in Bilderberger circles – is suffering from terminal cancer and “spilled his guts” to him on particular details of the globalist agenda now unfolding. Pastor Williams said the world is now at a critical phase in the globalist takeover scheme and that within the next few months we will witness the following important developments. The globalists plan to use China and Russia to strangle America and Europe and eventually reduce both to third-world status. According to Williams, trade between Russia and China will be not be conducted using the world’s reserve currency – at present the U.S. dollar – and this will further erode the value of the dollar and hasten its demise. In addition, the new trade will likely be used to bribe Europe into paying higher prices or possibly lose altogether its energy source provided by Russia. This prospect become painfully obvious in January when Russia and Belarus failed to renew an agreement on crude oil export tariffs and a cut-off of oil threatened the European continent. China is now the world’s largest energy consumer, having just passed the United States. As China becomes the preferred globalist model for the 21st century, its need for energy will come into conflict with the west. On October 19, the New York Times reported on China’s aggressive stance on resources. “China, which has been blocking shipments of crucial minerals to Japan for the last month, has now quietly halted some shipments of those materials to the United States and Europe, three industry officials said this week,” thus exacerbating already rising trade and currency tensions with the West. The globalists will once again manipulate the price of oil and further the process of destroying the economy and impoverishing the average American. 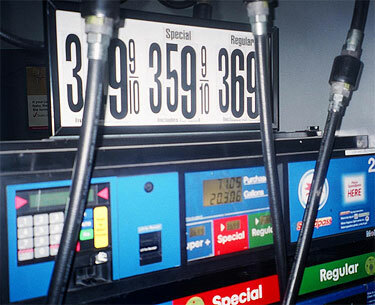 According to Williams’ source, gasoline will rise to between $4 and $5 per gallon and this unprecedented price increase will reverberate throughout the economy with massive inflation and food and consumer price increases designed to decimate the middle class. Oil prices are once again on the rise. Earlier this week, the price of oil went above $82 a barrel after a short-lived plunge in response to China’s surprise interest rate rise. Oil and gas prices have been rising to new highs since breaking through a previous high established in July 2008. In January, Williams told Alex Jones’ audience the insiders would devalue the U.S. dollar by 30%-50% within 12 months and oil prices would rise correspondingly. The Federal Reserve has since announced its intention to begin a “quantitative easing” program — in short, to print more dollars, expand the money supply, and buy Treasury Bonds and mortgage backed securities — and in the process devalue the dollar. The dollar is at or near all time lows in relation to many currencies, a fact reflected in the USD Index, which dropped recently to 77.00. According to Williams, the global elite have moved into precious metals and consider it the only safe haven from the catastrophe now unfolding in paper fiat currency. Lindsey said the value of gold and silver will escalate significantly as the engineered economic crisis unwinds. The current price of gold at $1,388 an ounce is only the beginning. As Alex Jones and Infowars.com have warned for several years, the globalists have carefully engineered the mortgage crisis as a weapon designed to hold the American public hostage and eventually own all residential and commercial real estate. Lindsey points out that the elite planned the current mortgage economic crisis in the 1980s and will allow it to fully ravage the economy to the point that the bankster cartel, through the Federal Reserve, will be asked to bailout the industry to the tune of around $45 trillion dollars. The result of this will the elite holding all mortgages and ultimately the destruction of all property rights once cherished by Americans. We can see this game plan unfolding in “foreclosure-gate,” a term used by the corporate media to describe the full-court press effort by large banks to “robo-sign” foreclosure paperwork and grab property. “Foreclosure-gate is heating up and the mad scramble for what’s left of $45 trillion in real estate is guaranteed to leave homeowners homeless,” writes Chris Kitze. Obama revealed his true colors as a teleprompter reader for the global elite when he gave a green light to JPMorgan Chase and Bank of America to resume home foreclosures, even as federal agencies have probed banks’ foreclosure-documentation process after at least three financial institutions in recent weeks said they would either review or suspend foreclosures because of possible errors. In other words, the process will be allowed to continue until the mission is accomplished. Finally, Lindsey Williams’ insider source reemphasized the inevitability of war with Iran, likely within a 4-5 month period. Although the prospect of direct confrontation with Iran has apparently diminished since the Islamic nation began operating its Russian-built Bushehr nuclear power plant, the threat has continued to simmer in the background. In particular, the globalist neocon faction demands a military “response” to Iran’ non-existent nuclear weapon program and insist bombing the country back to the Stone Age should not be “taken off the table.” Both Democrats and Republicans have repeatedly stated military action against Iran should be used in the event “sanctions” against the country fail. Iran’s National Prosecutor General Gholam-Hossein Mohseni-Ejei noted earlier this month that the U.S. and Israel are currently engaged in a low-level or “soft” war against his country. “Mohseni-Ejei stated that the enemy has not abandoned the traditional means of confrontation with Iran and the enemy is training terrorist groups to create insecurity in the country,” the Tehran Times reported on October 3. Williams’ source insists this low intensity covert war will break out into open hostilities early next year.